The ongoing inability for Florida state officials and the Seminole Tribe to come to an agreement over the continuation of their gambling compact is coming to a head this week, as state gaming regulators are telling tribal leaders that they will need to come up with a plan to shut down their blackjack tables if an agreement cannot be reached. In a letter sent by Department of Business and Professional Regulation secretary Ken Lawson, it was pointed out that the current compact between the state and the tribe requires the Seminoles to close down their blackjack tables within 90 days if the state legislature does not renew the provision that gives the Seminoles the exclusive right to banked card games in the state. Such a measure was considered, but failed to pass. That letter stands in stark contrast to the stance of the tribe. Tribal Council Chairman James Billie wrote his own letter last month, telling state officials that Seminole casinos could continue to offer banked card games, as they believe that the state has violated the compact by allowing electronic versions of card games like blackjack at some South Florida racetracks. These two stances may mean that the ultimate fate of blackjack at Seminole casinos will be decided in federal court. While both sides have said they would like to meet and resolve the dispute, their ideas of a resolution are far apart, meaning further steps would likely be necessary. For the Seminoles, the next step would ideally be mediation. The tribe has already made a request for such mediation, saying they would like it to take place sometime in the next 30 days. “The Tribe seeks to confirm…its present right to continue offering banked card games for the remaining term of the Compact…its right to stop making exclusivity payments to the State under the Compact and to instead make those payments into an escrow account; and…its right to expand the locations at which it is permitted to offer banked card games, ” the tribe wrote in its mediation request. The compact was to last for 20 years; for the first five years of the deal, five of the seven facilities operated by the Seminoles were to have the exclusive right to offer banked card games (in other words, games in which players played against the house, rather than against each other, as in poker). In exchange for that exclusivity, the Seminoles agreed to pay at least $1 billion to the state over five years. At the end of that term, which is set to expire on Friday, the exclusivity agreement would need to be renewed, or banked games would have to be discontinued. However, the Seminoles have argued that the state has violated that exclusivity deal in a number of ways. Not only do they object to the electronic versions of games that are now offered at some racetracks, but they have also questioned the “player-banked” versions of games like Three Card Poker that are offered at some parimutuel facilities. The failure of Florida legislators to reach an agreement with the Seminoles is part of a wider issue. Many in the state legislature have been trying to update and clarify Florida’s gaming laws over the past year, but a lack of consensus has meant little progress has been made on major gambling issues in the state. 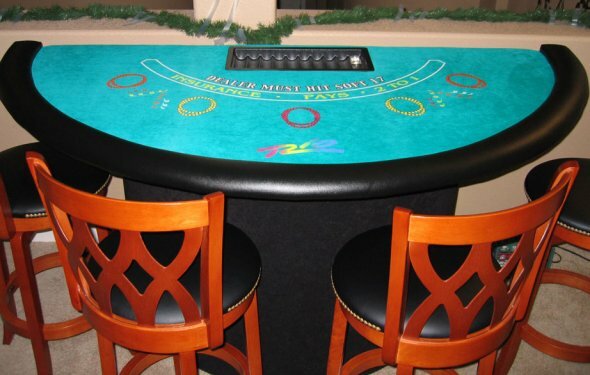 Pair of Folding Steel Casino Gaming Table Legs - Includes 2 Bonus Decks of Cards! 2 legs per order - with 2 bonus dekcs of cards!